Or was that Greenwood saying Gettysburg would never return to the Century? I've got to learn to shut up. First-time entrant Jim Tracy of Dayton, OH blitzed the field with five straight wins to take this year's championship. Jim defeated Ed Menzel of Fullerton, CA in the Final. Last year's runner-up, Ted Drozd of Chicago, IL finished 3rd, and the Gamemaster took 4th. Preliminary games were played from Tuesday through Friday. Friday night, the nine players who had played the required minimum of three games to qualify for elimination play were ranked, with the top four advancing. The top four were, in order, Ed Menzel (5-0-1), Ted Drozd (3-1-0), Vince Meconi (4-1-1), and Jim Tracy (3-0-0). Dave Zimmerman (5th place, 3-1-0) and Joel Ferich (6th place, 4-2-0) also won three games in the preliminary rounds, but missed the chance to advance on bonus points. 7th through 9th places went to Greg Smith, Mike Joslyn, and Andrew Miller. In the Saturday semfinals, #1 Ed Menzel squared off against #2 Ted Drozd while #3 Vince Meconi took on #4 Jim Tracy. Ed and Jim took the Confederates for bids of 2 and 3, respectively. Both games resulted in Confederate victories on July 2, Ed's by walkoff on Turn 13 and Jim's via Turn 12 concession. In the Final, Jim Tracy took the Confederates for a bid of 3. When the smoke cleared on Turn 16, Jim's Confederates were able to leave the field of battle with a 41-39 victory. The Confederates scored 35 VPs via kills and 6 via flips, while the Union compiled their points from the bid (3), kills (15), flips (5), and territory (16). A field of 27 turned out, just one off last yea'rs all-time high. The 37 games played were a new record. The Confederates won 25 games to 11 for the Union, with one tie. 28 games were played using the campaign (3-day) scenario, eight games used the July 1 only scenario and the other game used Scenario 4, July 2 & 3. 16 players bid for the Confederates (ranging from 1.0 to 3.5 Victory Points), and one bid 1.0 for the Union, while 20 games had no bid. The bids did not appear to change the final outcome of any game. With the preponderance of Confederate victories, perhaps bids need to increase. Playing time ranged from 30 minutes to 5 hours, and games took from 7 turns to 21. 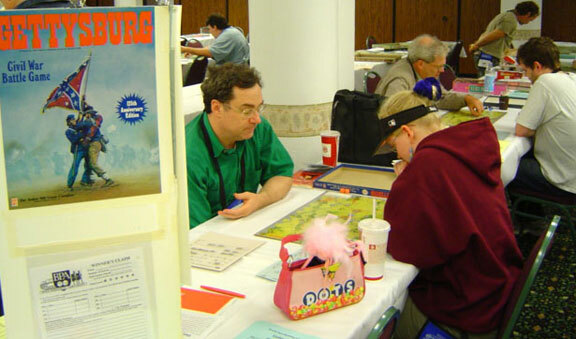 I'd like to remind folks that the first Boardgame Players Association PBEM Championship for Gettysburg '88 will begin on November 15, 2004. To enter, simply e-mail me. I'm pleased to report that Ric Manns has established a website for the event. The URL is http://www.geocities.com/firstbse19/gbgpbem.html. The site currently contains the complete event format and later will record the tournament brackets. A few of the format highlights are: 1) single elimination 2) seeded pairings based on AREA ratings 3) 3 months per round 4) bidding for sides, and 5) default scenario will be 6F, Scenario 5, the 3-day Battle of Gettysburg, using all optional rules except 10D, Extra Union Generals. When you sign up, you will receive a copy of the Rules Clarifications and the Terrain Clarifications developed for this year's World Boardgaming Championships and updates based on situations that occurred at the WBC.